Blue Nun, Germany – can you be serious? Every decade has its consumer and cultural icons: Elvis and brothel-creepers in the 50’s, The Beatles and mini-skirts in the 60’s, the Bee Gees and platform boots in the 70’s. Another gold-plated icon of that decade was Blue Nun, which introduced a whole generation to wine. But like other brands of the 70’s, Blue Nun is regarded by some as totem of the kitsch and the tasteless. Some big name 70’s brands have disappeared, whilst others are still going strong, often thanks to a successful relaunch. Ferrero Rocher has ditched the glitz of the ambassador’s party in favour of a more “sophisticated” image, whilst Pot Noodle – that peculiar instant meal made from dehydrated ingredients – has performed a spectacular turnaround, thanks to an anarchic marketing campaign that has made it trendy again. Like these brands, Blue Nun was saddled with a label that read “naff” in purple Day-Glo letters; no clued-up wine drinker would dream of bringing a bottle to a dinner party. But an early indication that Blue Nun today might be a different prospect, came when I was invited to visit their operation, not in Germany, but in the Languedoc in southern France. No longer is the Blue Nun label confined to Liebfraumilch (in fact, the “classic” Blue Nun is no longer a Liebfraumilch – more on that later), but the brand now extends to dry German Riesling, French Merlot, Spanish Rosé, and even Australian Shiraz. Meeting up at Stansted airport, I was surprised to find that of the handful of other journalists on the trip, only one was a wine writer. The others wrote “lifestyle” features for a panoply of well-known women’s magazines and newspapers. Was this, I wondered, where Blue Nun saw their market? Or was it a sign of their reluctance to expose their product to wine specialists? The answer wasn’t quite as simple as that: “our wine columnist turned it down”, I was told by one of the party, “he just laughed when the invitation came in”. Clearly, Blue Nun has a fight on its hands. The brand is huge (the most recognised wine brand in Britain according to a recent consumer survey by National Opinion Polls), yet those “naff” associations endure. The German family firm of Langguth bought Blue Nun’s parent company, Sichel, in 1996. I mentioned the scepticism of some of my wine-writing colleagues to Marketing Director, Armin Wagner (right). He shrugged, and a slightly pained expression crossed his face: “That is exactly the challenge we face. We have to get the wines in front of people and simply say ‘try this'”.Langguth’s first radical move was to upgrade Blue Nun from a Liebfraumilch, to a Qualitätswein. Liebfraumilch is a catch-all name covering huge tracts of Germany, for wines which needn’t contain a drop of Riesling. Qualitätswein, on the other hand, must come from a designated region (in Blue Nun’s case, Rheinhessen). Blue Nun now contains a minimum of 30% Riesling in the blend, and the wine is made in a noticeably drier style, with residual sugar reduced from 42 grammes per litre, to 28 g/l. So, “re-engineering” the basic product has obviously been one strand of Lannguth’s strategy, but what about a more wholesale makeover for the brand? “We simply do not have the budget for a huge campaign” Wagner told me, “We prefer to concentrate on making the wines people want to drink”. To that end, they are focusing on getting the new Blue Nun in front of potential customers, and have poured 500,000 trial samples at consumer fairs and exhibitions in the last two years. Whatever baggage Blue Nun carries with it amongst the cognoscenti, its popularity is booming with drinkers. According to the AC Neilson study (Off Licence News, July 2003), it sits comfortably above nemesis Black Tower in sales of branded wines, but also above international brands like Fetzer, Concha y Toro and Villa Maria. In fact, Blue Nun is selling more today than in its 70’s glory days, shifting five million bottles in 2002; a 15% increase on 2001. The softly-softly approach to Blue Nun’s rehabilitation is clearly working. Keith Lay is Marketing Director for Ehrmanns, distributor of Blue Nun in the UK. He answers difficult questions about the perception and quality of the wine with a refreshing lack of spin. Clearly he is aware of the brand’s problems and past reputation: “We don’t have an awareness problem with this brand, we have a perception problem”, he told me, “consequently our strategy is based around perception-changing activities”. Lay stresses the need to attract a new generation of consumers, and address their wine-drinking needs. Key in that strategy is “brand extension”, to lapse into marketing-speak for a moment. Though the classic Blue Nun is sold in more or less every wine market of the world, there are pockets of resistance to German wine. To give them a portfolio that will compete with the Australians and Chileans, Langguth has an ambitious programme that will see the Blue Nun brand include more and more varietal wines, sourced from the world regions best suited to their production. 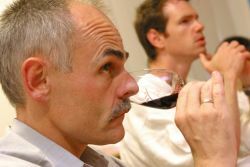 The Australian Shiraz is not in the UK market as yet, but consumer reaction to the Languedoc Merlot has been positive, with healthy sales through Safeway. Launched this summer, the Spanish Rosé seems well timed to link into a burgeoning pink wine revival. We set off for the Ferme des Lilas, a beautiful old vineyard in the Luberon, east of Avignon and north of Aix-en-Provence. Here André Brun, Director of the local Co-operative met us. 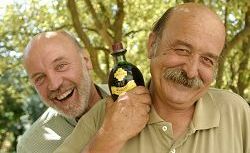 André (pictured on right) makes Blue Nun’s Merlot from grapes grown on the Farm. He was joined by François Escher (pictured on left), a local Courtier, who acts as Blue Nun’s representative. In the vineyards André spoke eloquently about the problems a long summer of drought was causing in the region, and then moved on to the co-op where the Blue Nun is made. The facility was impressive, with plenty of stainless steel and modern equipment. The one thing I didn’t see was a bottling line. When questioned, Armin explained that the finished wine was taken by road-tanker to Langguth’s Trier base in the Mosel Valley for bottling. Though bulk transport of inexpensive wines is very common, I questioned Armin on Langguth’s committment to quality, which surely suggests bottling at source. He explained that it was all to do with volume and distribution: eventually, if sales of the Merlot justify it, local bottling and distribution is planned, but for now Langguth’s operational hub remained in Germany. For me this was a visit full of interest. Not only is a German company making wines in France, Spain and Australia quite unique, but is was a great chance to discover how a company deals with a massively popular product, with a rubbished reputation – how might they set about “normalising” perceptions of their brand. Not least, I wanted to see for myself what the 21st century wines of Blue Nun tasted like. The tasting notes below will give the detail, but as a broad summary I would say that the wines of Blue Nun are thoroughly modern wines that might surprise sceptics. Don’t get me wrong – there was no blinding revealation here: this is mass-market, commercial wine of good, but unexceptional quality, offered at a fair price. But those who can shed their cynicism for a moment might be pleasantly surprised. In many ways it is the “classic” Blue Nun that holds most intrigue for me: here we have a decent German wine that is selling in droves, and occupying the best-seller territory of so many lookalike New World Chardonnays. That is exceptional, and I would love to see Blue Nun act as a springboard for a broader consumer appreciation of quality German Riesling. If only a tiny fraction of Blue Nun’s fan-base graduates to an appreciation of fine Kabinetts and Spätleses, then there is one more reason to look more favourably on this tarnished icon, and one of the wine world’s genuine survivors. Very pale straw/green. Quite subdued but gently floral nose, with a nice nutty apple quality and hints of juicy peach. On the palate it is off-dry, with light, grape and apple flavours, and hints of nectarine. Sufficient acid to balance, this is refreshing and quite crisp, with a soft yet persistant finish. Very good. 9.5% alcohol. Very pale green colour. Quite a reserved, slightly leafy nose with a touch of nettle and a suggestion of lime. There’s a nice clean, slaty minerality. Palate is crisp and dry, with clean, juicy apple fruit and good texture. Plenty of citrus acidity cuts through and extends the finish. A modern, appetising dry riesling. Very good. 11.5% alcohol. From Manchuela in south-east Spain, this is Blue Nun’s latest addition to the range, a generously fruity and just off-dry rosé of good quality. There’s a slightly confected note on the nose at first, with suggestions of love-hearts and rose-hips, then a nice fruitiness emerges. On the palate it is sweetly-fruited with plenty of jammy, summery, cherry-cola fruit and a nice restraining balance of acidity leaving the finish quite dry. Soft and very sippable, this is a very nice, uncomplicated rosé with some style. From vineyards close to Aix-en-Provence, this has a slightly baked plummy fruit quality on the nose, with a cherry note. On the palate it is quite dense and rich, with soft plum and berry fruit and background tannins. Acidity is low, but adequate, and this slips down well in an easy-drinking style. A version of this article first appeared in Off Licence News.